Our Reseda car accident lawyers and law firm provide expert personal injury legal services for those injured in auto, motorcycle and other accidents, and for the relatives and families of those killed in car and other accidents for wrongful death claims, in Reseda, California, a community of 62,174 people, located in the city of Los Angeles, California. If you had a car accident or other personal injury claim in Reseda or anywhere else in California, please contact our injury attorneys and legal team now for a completely FREE CONSULTATION . As one of the first suburbs in the San Fernando Valley, Reseda continues to grow and is bordered on the north by Northridge, on the east by Lake Balboa, on the South by Encino and on the west by Tarzana and Winnetka. 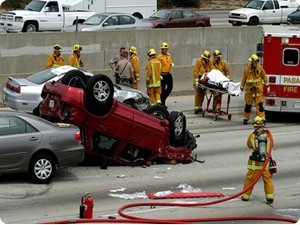 A Reseda car accident can injure people and be extremely traumatizing for the victims involved so it is essential to have an experienced car accident lawyer on your side. Our over 40 years of success in handling car accident and other personal injury cases in Reseda and throughout California has given us the recognition of PERSONAL INJURY LAW FIRM OF YEAR 2011 and two of our attorneys, Robert Walch and Gary Walch, were each selected as Top Lawyers in California (Highest in Ethical Standards & Professional Excellence). Our aggressive but compassionate lawyers and staff have resolved many thousands of cases and work extremely hard to make the claims process easy for our clients, the victims and their families. We invite you to visit our new and updated Car Accident Web Site. One common injury that victims of car accidents suffer is whiplash. Whiplash is a non-medical term describing a variety of injuries to the neck caused by a sudden and irregular motion to the neck. A whiplash injury may be the consequence of abnormal stretching of the spine, mainly the anterior longitudinal ligament (the ligament that runs down the anterior surface of the spine) which is extended or tears, as the head snaps backwards and then forward causing a whiplash type injury. These tremendous motions push the neck muscles and ligaments beyond their normal range of motion, causing injury. The most frequent symptoms related to whiplash injury from accidents include neck pain and stiffness, headache, shoulder pain and stiffness, dizziness, fatigue, jaw pain, arm pain, arm numbness and weakness, visual disturbances, ringing in the ears and back pain. Proper medical care is crucial and our firm is able to contribute names of numerous doctors to treat such problems without any advance payment. The Law Offices of Gary K. Walch provides you with the strong advocacy that you need when you or a loved one has been through a destructive car accident or other personal injury accident in Reseda or anywhere in California. It is our job to best embody your interests and aggressively pursue your rights. Our staff handles accidents involving car, motorcycle, truck, bus, train, bicycle, pedestrian, hit and run, uninsured motorist (UM) and much more. Call us for an absolutely FREE consultation to review and analyze your car accident or other personal injury case. For your convenience you don’t even need to leave the comfort of your own home. Just like many of our clients you can do everything by telephone at 818-222-3400 or toll free 866 INJURY 2 (465 8792), email (info@WalchLaw.com) or simply complete our very easy to use contact form.